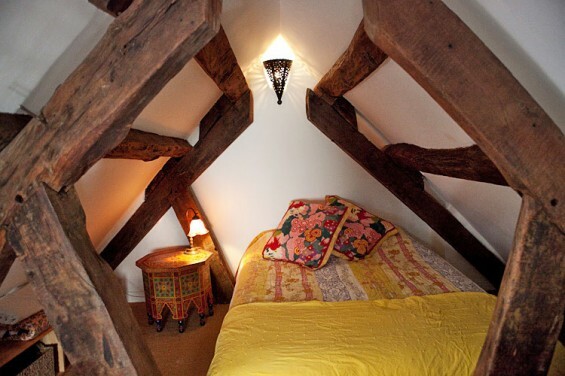 This apartment feels part country home in the middle of Paris and part dollhouse, thanks to those over-sized, exposed wooden framing beams, which give a rustic vibe and play with the scale of the rooms. 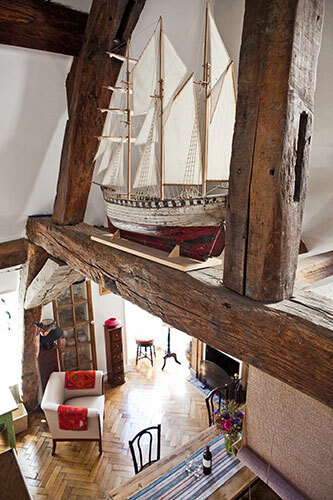 The owner, a Franco-American who travels regularly for work and spends much of her time in London, sourced many of the interior architectural elements—cabinets, stairway and mantel—from brocantes (the French flea market). 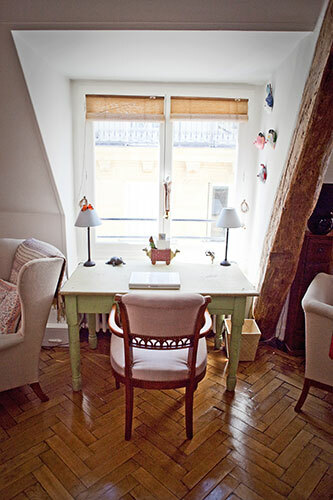 Decorated with an eclectic mix of textures, patterns and treasures from her far-flung travels, the apartment feels personal and really special, like it would be a privilege and an inspiration to get the key and hang out with her belongings for awhile. Two bedrooms, one bathroom. Price starts at $2,400/week. 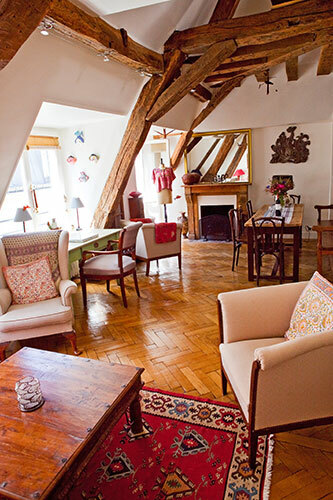 Location: In the heart of the Latin Quarter, right next to the Sorbonne. 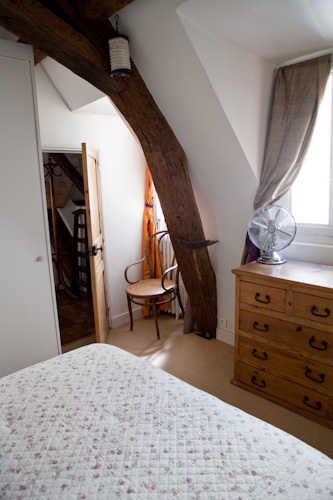 Rent it at haveninparis.com. Oh my god! these paris spots are awesome!!!! It is actually a nice and helpful piece of information. I am satisfied that you simply shared this useful info with us. Please stay us informed like this. Thanks for sharing. Its superb as your other posts : D, thanks for posting . “If Christ were here now there is one thing he would not be–a christian.” by Mark Twain. It’s really a great and helpful piece of information. I am glad that you simply shared this useful info with us. Please keep us informed like this. Thanks for sharing. You can definitely see your enthusiasm in the paintings you write. The arena hopes for more passionate writers such as you who are not afraid to mention how they believe. All the time go after your heart. “Every man serves a useful purpose A miser, for example, makes a wonderful ancestor.” by Laurence J. Peter. Thank you for sharing superb informations. Your web-site is very cool. I am impressed by the details that you have on this website. It reveals how nicely you perceive this subject. Bookmarked this web page, will come back for extra articles. You, my pal, ROCK! I found just the information I already searched all over the place and just could not come across. What an ideal web-site. Some truly nice and utilitarian information on this site, as well I conceive the style holds wonderful features. you’re in point of fact a just right webmaster. The site loading velocity is incredible. It seems that you are doing any distinctive trick. Also, The contents are masterpiece. you have performed a magnificent job on this subject! Its wonderful as your other content : D, appreciate it for posting . “Always be nice to people on the way up because you’ll meet the same people on the way down.” by Wilson Mizner. Some really fantastic info , Gladiolus I noticed this. “Sell your cleverness and buy bewilderment.” by Jalal ud-Din Rumi.